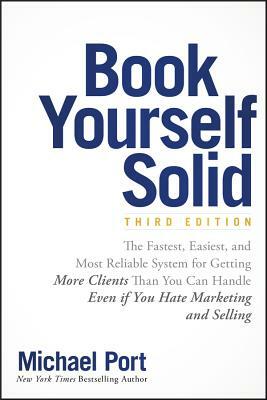 Book Yourself Solid is a handbook for self-promotion that translates into results. We tend to think of "busy" as the equivalent of "successful"--but that's not always the case. The key lies in what you're busy doing. Success means spending your time doing work that gets you closer to your goals, and the critical driving force behind that success is self-promotion. This book shows you how to promote more than just your skills--you need to sell your reputation, your service, your very self. It starts with laying a foundation so potential clients know you can give them what they want and need. How do people see you, and how does that diverge from what you would like them to think? Once you know where you are, you can map out a plan for getting where you need to be, and this book shows you how to build the reputation you need to be the go-to person in your field--and keep the business coming in long-term.